For the longest time, I've wanted to show before and after examples of my work but have never done so because to me, it could be a form of embarrassment to my clients. One day recently, however, my husband was in need of a headshot and gave me his blessing to do a before and after post. However, before we get to the results, let's go over some facts and controversies involved in post-processing. Even most newborns have skin that is blotchy and imperfect and I'm not even talking about baby acne that can start as early as day 10. So basically, straight out of the womb, we're out of luck in the skin department. Consider all those sunburns you've ever had and all the days so far in your life that you went outside without sunscreen on? That's a lot of sun damage we've accumulated considering in the Maryland/DC area, there are UV rays every single day of your life even when it's rainy or overcast. Because many magazine companies strive for the pinnacle of perfection, there are loads of us women who feel like we don't meet the mark of beauty. Even with my extensive Photoshop knowledge, I have to remind myself regularly that no one can check off this level of beauty, not even the women featured in the magazines. However, air brushing to an extent is important because extra detail can distract from what's most important in an image. No one remembers any of the blotches or blemishes on your baby except for the camera. The same can be said for yellowing teeth, dark tired eyes, or acne spots that crop up once a month or for a season in your life. The camera picks up on things that our brains automatically filter out. If you take out a white piece of paper at night, the paper will have a yellow, green, or blue cast to it in a photograph depending on what kind of lighting was on before white balance has been adjusted. Yet, when we look at the paper, it appears white to us. That's because our brains quickly filter this information out. "Why is he pink in the before picture?" Skin can also become more or less magenta, based on our body temperature, activities we're doing, and blood flow. We usually don't notice this, but the camera captures it. When it comes to skin and portraits, everyone can use a little help. 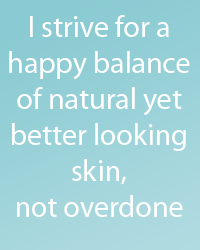 In Photoshop, I strive for a happy balance of natural yet better looking skin, not overdone unless upon request. Place your cursor over the "after" image to see the "before" shot. Note: Normally, my husband would have had his hair cut for just the occasion, but due to circumstances outside his control, there was no time. So I ended up recreating the tops of his ears and "trimming" his sideburns. Every so often, I like challenges like this anyways because I get to brush up on my technique. Notice the difference in skin tone and texture. Eyes are the focus and skin shouldn't distract. No yellowing teeth. No dark tired eyes. No chapped lips. No plastic skin. His personality shines through.